So, I finished Romans. A little early! I decided to just move on to the next of Paul’s letters, so 1 Corinthians, here I come! What might seem “foolish” to some is actually wiser than our most intellegent philosophers. 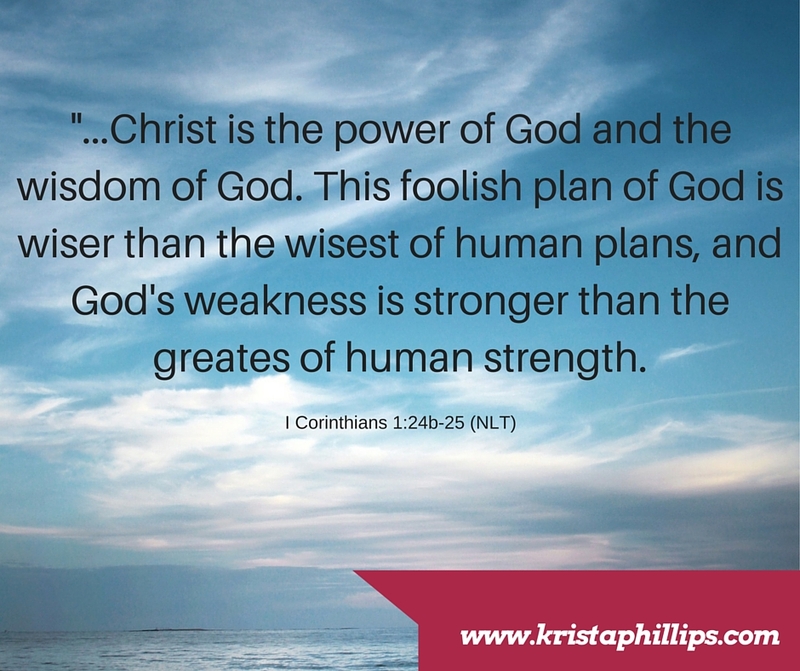 And what some view as God’s weakness (his son dying) is stronger than our biggest strengths. It is a reminder to me of how foolish it is to try and put God in a box. I was trying to explain this to my Lacy a few weeks ago when she was asking some GREAT questions about God. Our brain is filled of “boxes” of truths. Things we know, understand. Those truths are shaped by our experiences and perspectives. Sometimes we take out a truth, erase a few things, make some corrections, as we grown and learn. So our truths aren’t always “accurate” but things we believe, sometimes even passionately. They are truth to US. Our human nature is to take the truth of “God” and toss him into the box of “higher being.” Or, for some, toss out that box all together because our experiences have taught us that there isn’t any truth in that at all. God cannot be fit into a box. Not accurately anyway. If we could put God into a box and keep him contained there, then he would be nothing more than a human flawed perspective. That brain that has all those boxes? So if you ever look at that “higher being” box and see the lid closed, thinking God is packed neatly inside, I suggest you open the lid, because it is full of lots of human assumptions and errors. Because God cannot be “understood” completely by the meer human brain. In fact, as a believer in Jesus, I believe that I will spend all my days taking steps closer and closer, learning more, and more, but the image will not be made complete until we are in heaven. I'm enjoying your daily verses (even if I don't check daily). I pre-ordered your latest book! No worries on checking daily!!! Even I skip a few days here and there –its just a fun way to spread the scripture love! And YEAH!!! Hope you enjoy it!! !